This topic describes how to upgrade an existing SignalR 1.x project to SignalR 2.x, and how to troubleshoot issues that may arise during the upgrade process. Update your Package Manager to the latest version. Install the Web Platform Installer. In the Web Platform Installer, search for and install ASP.NET and Web Tools 2013.1 for Visual Studio 2012. This will install Visual Studio templates for SignalR classes such as Hub. Some templates (such as OWIN Startup Class) will not be available; for these, use a Class file instead. SignalR 2 offers a consistent development experience across server platforms using OWIN. This article describes the few steps that are needed to update a SignalR 1.x application to version 2. While it is encouraged to upgrade applications to SignalR 2, SignalR 1.x will still be supported. This tutorial describes how to upgrade a web-hosted application to SignalR 2. Self-hosted applications (those that host a server in a console application, Windows service, or other process) are now supported under SignalR 2. For information on how to get started creating a self-hosted application with SignalR 2, see Tutorial: SignalR Self-Host. The following sections describe tasks involved with upgrading SignalR projects, and how to troubleshoot issues that may arise. 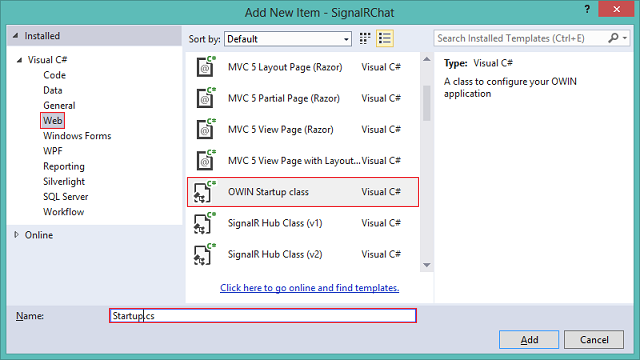 In this section, you'll update the application created in the SignalR 1.x version of the Getting Started Tutorial to use SignalR 2. Once you've finished the Getting Started tutorial, right-click on the project, and select Properties. Verify that the Target framework is set to .NET Framework 4.5. In the HTML page, update the script reference for SignalR to match the version of the script now included in the project. In the global application class, remove the call to MapHubs. Right-click the solution, and select Add, New Item.... In the dialog, select Owin Startup Class. Name the new class Startup.cs. The assembly attribute adds the class to Owin's startup process, which executes the Configuration method when Owin starts up. This in turn calls the MapSignalR method, which creates routes for all SignalR hubs in the application. Run the project, and copy the URL of the main page into another browser or browser pane, as before. Each page will ask for a username, and messages sent from each page should be visible in both browser panes. This section describes issues that may arise during upgrading. For a more comprehensive list of errors and issues that may occur with a SignalR application, see SignalR Troubleshooting. This error will occur if a reference to Microsoft.AspNet.SignalR.Owin is not removed. This package is deprecated; the reference must be removed and the 1.x version of the SelfHost package must be uninstalled. Verify that the script references in your client are up to date, and that the OwinStartup attribute for your Startup class has the correct class and assembly names for your project. Also, try opening up the hubs address (/signalr/hubs) in your browser; any error that appears will offer more information about what's going wrong.